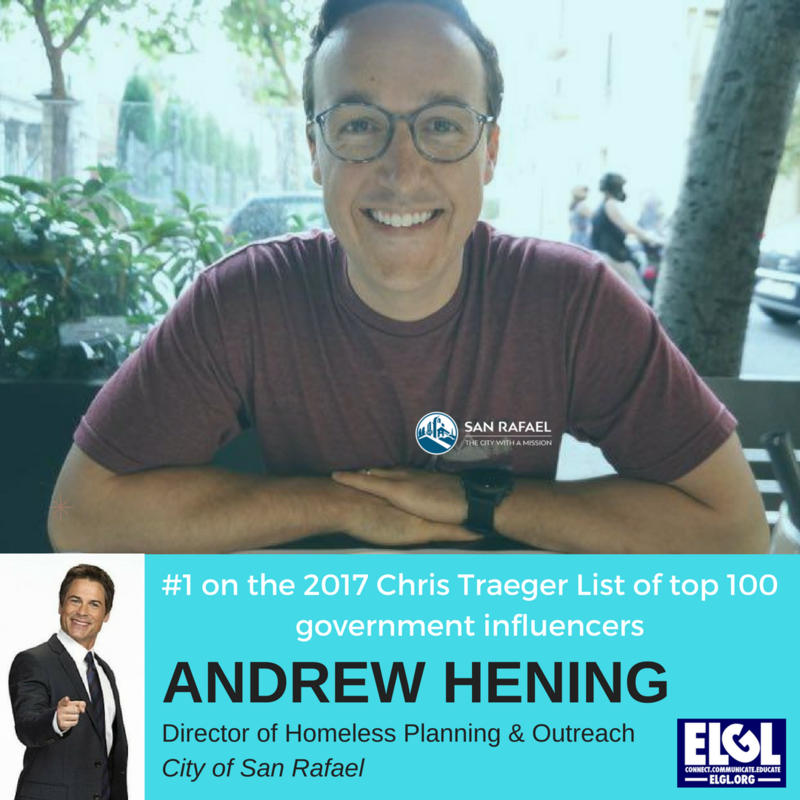 Andrew Hening, the City of San Rafael’s director of homeless planning & outreach, was named a top influencer by the local government association Engaging Local Government Leaders. The list of influencers is dubbed the “Traeger List” in honor of fictional City Manager, Chris Traeger, of the television show Parks & Recreation. “Our perfect Traeger list award winner is someone who has a jam-packed daily schedule, but makes time for an informational interview or to present a webinar to a nationwide audience. Our list is full of individuals who quiver at the phrase ‘I’m too busy,’” ELGL said in announcing its list. Hening joined the City in March 2016, to bring a strategic focus to the City’s efforts and partner closely with other organizations, such as the County of Marin, who have a larger assortment of tools than the City to address the negative impacts of homelessness in San Rafael. In addition, he acts as a central point-person for the general public and drives the City’s communications on the topic. About ELGL: The Engaging Local Government Leaders is a nationwide organization of more than 2,300 members from 48 states who are committed to connecting, educating, and communicating with all stakeholders in the local government arena. ELGL members represent all functions of local government from planners to finance directors to city managers to elected officials.